The horror genre had an especially great time in the 70's and 80's with special effects and color booming across movie screens. And ,special effects amke up artist like Tom Savini were busy in almost everything that came out around that time. One movie that in my opinion, was the inception for Inception was Dreamscape, starring Dennis Quaid, a very hot Kate Capshaw, Max Von Sydow, George Wendt (NORM!) and as the villain , "Waaariors, come out to playeeaay!" himself, Mr. David Patrick Kelly. This movie is about psychics that have the ability to enter people's dreams if they're in the same room or close proximity to them. Dennis Quaid plays Alex Cardner, a once heavily studied great psychic anomaly at 19-years of age a prime subject of a scientific research project documenting his psychic ability, but in the midst of the study he disappeared and has since been using his talents solely for personal gain, which lately consists mainly of gambling at the race track. He wasn't very spectacular, he could display some telekinesis and pick winning numbers, but that is good enough to train him to enter your dreams at Freddy Kruger University! (I forget the name of the school) The University program studying these psychics and honing there skills is run by Max Von Sydow who plays, Novotny Alex's original therapist and doctor examining his abilities. He's not the only one though, this is where David Patrick Kelly comes in as Tommy Ray Glatman, another psychic with a big ego because he's the first to be used to enter other people's dreams. The project exists to help people get over fears, or sleep difficulty but there seems to be more that can be done and that is gain information. This is where the government comes in and we come to find out that they fund the program to find their first crop of dream spies, not only to find secrets, but kill enemies. The opening of the film shows the President of the United States waking up from a nightmare about the fallout of nuclear war. The dreams bother him so much he considers peace talks and disarmament to prevent the apocalypse. Cheyney...whoops, I meant Blair his number one black ops executive decision maker doesn't like the idea of being perceived as week so he thinks it best the President not wake up from his next nightmare. He hires Tommy Ray to take him out, and there is the plot of the film. Tommy Ray is in his senior year at Freddy Kruger University so he's pretty good at invading dreams and manipulating them to serve his purposes. The confrontation scene is the best part of the film because you get to see how good he is as well as some pretty awesome special effects for the time. We also get to see a pretty decent nun-chuck display when in stopping Alex and the president and he asks, "You guys like Bruce Lee movies? I've seen Enter the Dragon six times". 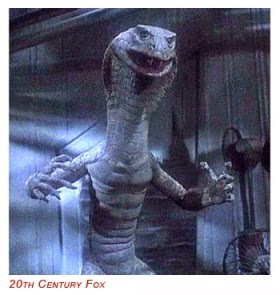 There's a pretty awesome snake-man monster special effect in the film too fans of Ray Harry Hausen will appreciate along with the mix up of make-up and animatronic effects. 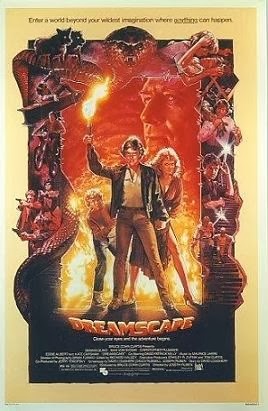 Dreamscape is up on +Netflix now for streaming so if you're having trouble falling asleep, fire up your streaming device of choice and check it out.